Biotechnology and pharmaceutical organizations are increasingly viewing bioinformatics as an integral part of their research processes. Biomedical industries are seeking to make use of vast amounts of genomic data to produce complex and accurate biological models. Brandeis GPS will be offering Molecular Biology, Genetics, and Disease as a part-time, fully online course this October. The 10-week course will introduce students to the basic concepts of molecular, cell, and developmental biology. It will cover classic genetics, from Mendelian inheritance to quantitative and complex traits, associations and population genetics. It will address the anatomy and function of genomes from humans and model organisms. Using the Human Genome Projects as an example, students will learn sequencing and mapping technologies. Basic sequence analysis methods will be introduced, along with techniques to navigate genome browsers and other relevant databases. 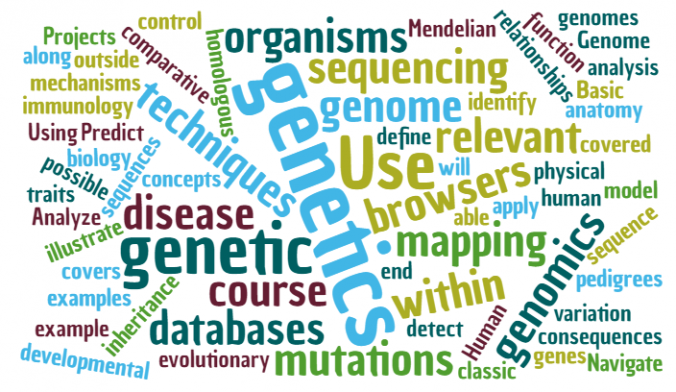 Navigate genome browsers and databases relevant to genetics and genomics. Analyze pedigrees and apply genetics to identify disease associations. Use techniques of physical and genetic mapping and sequencing. Use comparative genomics to detect homologous sequences within and between organisms and to define evolutionary relationships. Predict possible consequences of mutations and genetic variation within and outside of genes. Use examples from developmental biology, human disease and immunology to illustrate genetic control mechanisms and mutations. At Brandeis GPS, you can take up to two courses before enrolling in one of our 12 online master’s degrees. If you’re interested in exploring the MS in Bioinformatics, or would like to explore molecular biology to fill a bioinformatics skills gap, contact the GPS office for more information or to request a syllabus: 781-736-8787, gps@brandeis.edu, or submit your information.